Toggling the blue sliders will move the coordinates of the blue magnet. 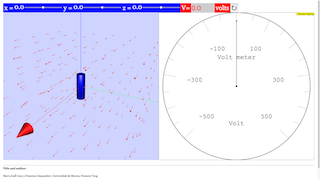 This will cause spikes/sudden jumps in the voltage as shown in the red field and voltmeter reading. Note that the voltage is uneditable. Double clicking anywhere will toggle full screen.